Whether you’re planning a spring break vacation to the beach with the kids or simply trying to take advantage of shoulder season deals, rest assured that you’ll find amazing things to do on the Outer Banks in April! Maybe you see yourself attending an exciting annual event. Perhaps you’d prefer exploring the coastline and looking for Corolla’s wild horses. You can look forward to beautiful weather, fewer crowds, and loads of fun! Don’t forget to request our free Vacation Guide for even more ideas to include in your spring OBX itinerary! The weather on the Outer Banks in the spring sets the scene for countless outdoor adventures. The temperatures rise throughout April, reaching the mid to high 70s! It’s the perfect opportunity to hike and explore Cape Hatteras National Seashore and admire the area’s flora and fauna this time of year. 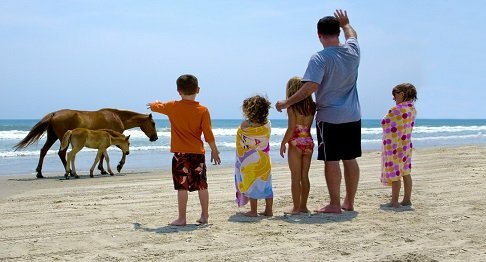 The entire family will appreciate the opportunity to see Corolla’s famous wild horses! These majestic Spanish colonial mustangs wander the sandy dunes. You won’t regret booking an Outer Banks horse tour while you’re in town! Travel Tip: Be sure to check out Paramount Perks for discounted rates on horse tours! Use the chilly water temperatures as an incentive to stay on your board! Master a new-to-you watersport while you’re on Spring Break on the Outer Banks! Take lessons from experts who will guide you and share their knowledge. You’ll be kiteboarding in no time! Not quite ready to dip your toes all the way in yet? Try parasailing or hang gliding instead! In April, all of the local OBX restaurants begin reopening for the season! Whether you’re looking for a relaxed lunch spot or a fancy fine-dining establishment, you’re in luck! Explore the best restaurants in Corolla and other surrounding beach town eateries during your vacation! Some say the fishing is even better on the Outer Banks in the springtime! Whether you’re looking to ride along with a charter for deep sea fishing or planning to keep your feet on land surf fishing or pier fishing, you’re in for a “reel” treat! Many of the beaches on the Outer Banks allow dogs on or off leash depending on the time of year! Before the busy season hits, you and your best bud can spend your days frolicking in the sand and saltwater! 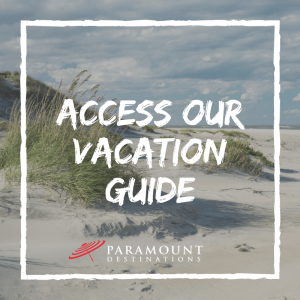 Travel Tip: Paramount Destinations offers a wide variety of beautiful vacation homes that allow dogs! 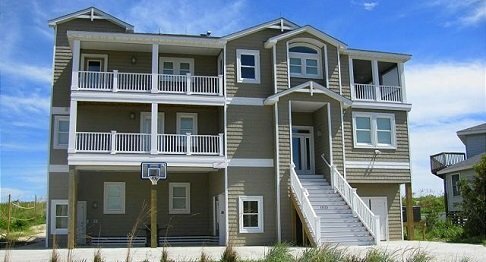 If you decide to plan a vacation to the Outer Banks in April, be sure to stay in one of Paramount Destinations’ amazing properties! With homes scattered across the Outer Banks from Corolla to the Southern Shores, you can optimize your stay by selecting the perfect home for what you want to get out of your vacation! 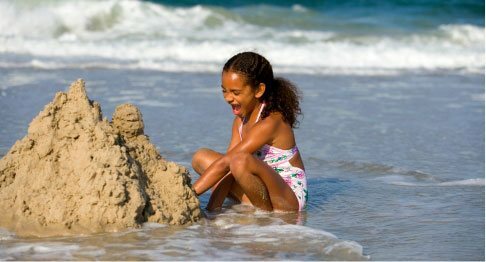 Once you choose the perfect place to stay, take a look at our OBX vacation packing list to start planning your trip!